My wife's long distance telephone call to France, on last Monday morning, got me the latest news on my nephew, James Wilson, who is studying theater in England. 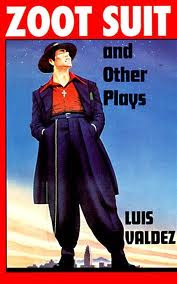 That led to a spirited discussion about theater, and reality, and to my wife's prompt production of the pictured edition of Zoot Suit and Other Plays, by Luis Valdez. Valdez is considered to be the "father of Chicano theater in the United States," and he is currently teaching at California State University, Monterey Bay. The underlined and much-used volume was cited for its recitation, in the "Introduction" [Page 10], of an excerpt from a poem that Valdez wrote to define his neo-Mayan philosophy, Pensamiento Serpentino, identified as a "Chicano approach to the theater of reality." Which is to say that we create the world we inhabit as we act, and what seems most apparent, and solid, is simply the scenery that we mistake, too often, for reality itself. Click on the link to Pensamiento Serpentino to find not only an approach to the Chicano theater of reality, but to life itself. I love your use of Valdez's poem and I always appreciate the fact that you let us readers figure out the meanings for ourselves. For me, those lines say many more things. For example, possibly even when we are in New York City or Tokyo, in "reality," we need to know that we are always actors. Conversely, when on stage, a good actor is acting out of real feelings and experiences. What I was trying to say to James on the phone was that the earliest actos of Teatro Campesino were built out of a community that was in the middle of the grape strike, right on the line (literally the picket line) between teatro and el mundo. The plays on the picket line were performed by campesinos who took the parts of themselves, the scabs, and the Patron (played with a pig mask). Their actos were written by themselves and were both an escape and a representation of their experience. Thanks so much!! I made a new blog entry (#6) thanks to this!! !